The TransferText method allows you to import from, link to, and export to text files. It has the following syntax. As you would expect, various parameters can be used to specify how the method should execute. These parameters are similar to the TransferDatabase and TransferSpreadsheet methods you have already seen. The following table explains the use of each parameter. Type of transfer to be performed. The default is acImportDelim. See the help documentation for a complete list and explanation. Name of import or export specification you have saved in the current database. This argument can be left blank for delimited text files. String expression that contains a table name you want to work with or a query you want to export. Filename and path of the text file you want to work with. Use True to use the contents of first row of the spreadsheet as field names and False to treat the first row as data. False is the default. Use with acImportHTML or acLinkHTML. Name of table or list in HTML file you want to work with. If blank, the first one is assumed. Long value indicating the character set of the code page. Next, we'll jump right into importing data from a text file. 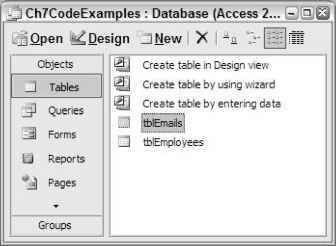 Now, you import data from a text file into a new table, called tblEmails, in your Access database. 1. Create a text file as shown in Figure 7.3 and save it in C:\temp. "First Name", "Last Name", "Email" "Denise", "Gosnell", "denisegosneliSyahoo. "John", "Doe", ";[email protected] com" "Jane", "Doe", "[email protected]"
2. Add the following procedure to the module in your database. 3. 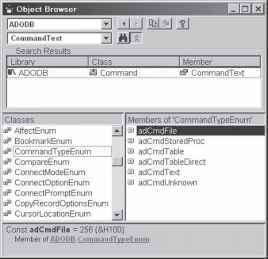 Run the procedure from the Immediate Window in Visual Basic Editor. 4. Return to the database window and you should see a screen similar to that shown in Figure 7.4.